Many homeowners approach a full kitchen remodel only to be stunned by the cost of the project. Prices in the low five figures are routine, with some even approaching six figures. 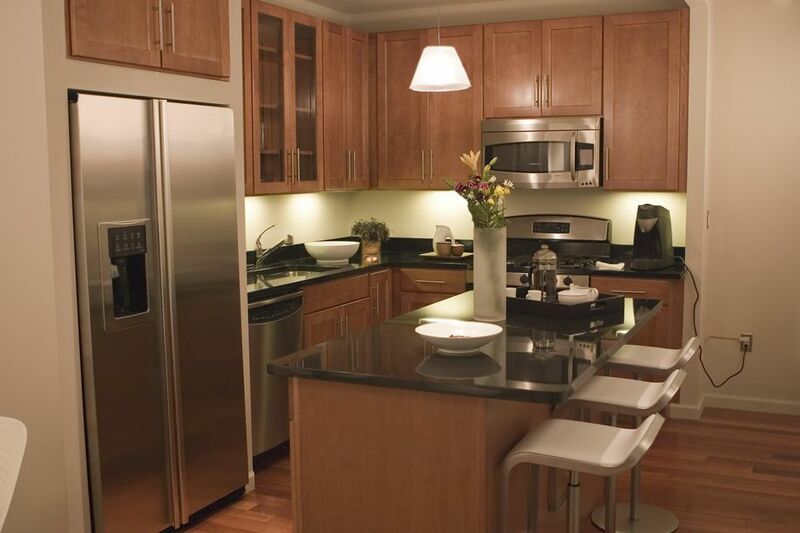 What is the driving force behind sky-high kitchen remodeling costs? Usually, it's the kitchen cabinets. Kitchen cabinets can represent a third or up to a half of the total kitchen remodel cost. And for good reason: much material is contained in the cabinets, with some of that material in the form of expensive hardwood veneers. Add unique fixtures and accessories like slide-outs, organizers, and lazy susans, and the price climbs even higher. Buying, bartering, or otherwise obtaining used kitchen cabinets of acceptable quality is one way to pare down the considerable costs associated with new cabinets. While savings can be deep, unless you are prepared to take on major detective work to find the cabinets and accept some limitations, you may want to look at other cost-saving measures such as buying new RTA (ready to assemble) cabinets. Previously owned cabinets are found in two major forms: used working cabinets or display cabinets. Used working kitchen cabinets are those that have been used in a home for kitchen work. Often the owner or contractor wants to remove these cabinets as part of a kitchen remodel. In contrast with new cabinets that are clean, functioning, and expensive, used kitchen cabinets can be dirty, beaten up, and often non-functional or unattractive. Usually, these types of used cabinets are very cheap or even free. Used display kitchen cabinets are those that have been displayed in a home improvement store or kitchen/bath remodeling showroom. When you visit a home improvement store or a local kitchen/bath remodeling showroom, you will see several kitchen cabinet displays mocked up to look like real kitchens. When a store needs space, goes out of business, or wants to get rid of a discontinued line, it must remove their display cabinets. Display kitchen cabinets fall in a twilight area between new and used. They may be beaten up, but not as beaten up as cabinets that come from real kitchens. They can be dirty but never dirtied with cooking grease and food residue. Since homeowners usually buy an entire kitchen's worth of cabinets, not just one or two, these displays can be full-size 10-foot by 10-foot kitchens and might even include non-cabinet elements such as sinks, faucets, and even lighting. With used working kitchen cabinets, you may get a set of cabinets only. Or homeowners might include the countertop, as it has no value to their next set of cabinets. They might include the sink and leave it attached to the kitchen countertop. With used display cabinets, you may find quality brand-name cabinets such as Kraftmaid, Merillat, Wellborn, Quality, StyleCraft, and more. It is common to find farmhouse-style white/glazed pantry and base cabinets, with pullouts, glass door inserts, cutting board, and fixtures, marked down deeply from its original price. Or you might find maple cabinets with soft-closes, including a farmhouse sink, copper faucet, quartz counters, and cabinet lighting, marked down to half of its original price. You may find those accessories, plus breadboxes, wine racks, and spice racks. The reason for all these accessories? As these are display models, the manufacturers and retailers wanted to trick out the display to show off and sell as many extras as possible. Used working kitchen cabinets are rarely in stellar shape. These cabinets have often been used for years and may be stained with cooking grease and food. The cabinet doors, drawer fronts, and sides of the cabinet boxes may be delaminating. This is especially true if the cabinets are thermofoil. If the cabinets have already been removed from the kitchen, there is the chance of some breakage. Used display cabinets have gotten use but not cooking use. Customers open and close the doors and drawers thousands of times and let their children use them as toys while they talk to the service representative. The cabinet displays are usually dated. If a kitchen cabinet showroom is getting rid of a display due to changing trends, then by definition the display is stylistically outdated. Showrooms like to store heavy items, such as granite countertop samples, in the drawers. But in general, it benefits the showroom to keep those cabinet displays looking as good as possible. Green Demolitions: This online company based in Greenwich, Connecticut offers display and other used cabinets that are typically half off the retail price. Architectural Salvage: Essentially high-class junkyards, architectural salvage yards, found in most large metro areas, usually have used kitchen cabinets or acceptable quality. Craigslist: You will find some kitchen cabinet displays for sale listed on Craiglist or eBay. Because it costs so much to ship cabinets, local is the only way to go. Most sellers will not even consider shipping the cabinets. Showrooms want the sale to be as easy for them as possible, preferring a local buyer who can take receipt with a delivery truck or pick them up. Scoring used kitchen cabinets on Craigslist is a game of speed. Routinely check Craigslist and immediately contact the other party when you see an offer. Legwork: Your best bet for finding display kitchen cabinets that are for sale is to contact showrooms by phone or in person. Ask to speak to the manager. By shaking enough trees, you may find showrooms willing to part with displays for large price reductions.